I will contact you about availability and to exchange postal addresses. OR in CASH EQUIVALENT in your local currency notes. Price GBP 10.00, postage is included. ISBN 0-9532844-2-5. Payment: Sterling cheque, or your local currency cash. 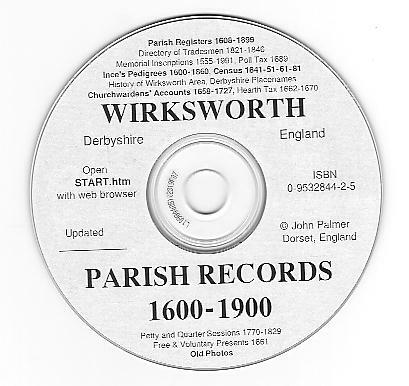 Wirksworth Parish Records 1600-1900 are now being sold on CD for 10 pounds sterling. This includes: gold standard CD, jewel case, case info label, CD box, receipt, postage, a signed "Thank you" card from the Author and a hotline for database searching and help with Wirksworth family trees. A disc info label is not now used as this reduces the lifetime of the disc. To see what's on the CD, browse: http://www.wirksworth.org.uk its exactly the same. The CD contains 452,000 basic records covering 40 square miles around Wirksworth town and the period 1600-1900. There are over 13,000 different surnames, 3,000 pages of data and graphics, and over 50,000 people are mentioned using 8 million words. If your PC can browse the Internet, it can read this CD with its browser. Speed of movement around this huge website is astonishing with all files on CD and the use of 207,000 internal links. No more aggravation with ISPs, telephone charges and downloading delays. Spend all day browsing the Wirksworth website. Get to know the website better than the Author. Unique transcriptions included are: complete Parish Registers, Ince's Pedigrees, Wills Index and Churchwarden's Accounts. Also Census 1841-51-61-71-81-91-1901 and Old Photos. Everything thoroughly indexed and cross-referenced. Full up-to-date details of what's on the CD can be browsed on: . Anyone interested please send sterling cash, travellers cheque or your local currency cash to the address below. Postage included in price, airmail outwith UK, 1st class within. Edith was born in the same cottage she has lived in for over 80 years, on the main street of Middleton-by-Wirksworth. She tells wonderful memories about her Chapel, Schooldays, Starting Work, Water, Village Life and courting. She is a Lady, with whom I spent 3 happy hours chatting in 1997. If your folk come from Middleton or nearby, you will love this booklet.